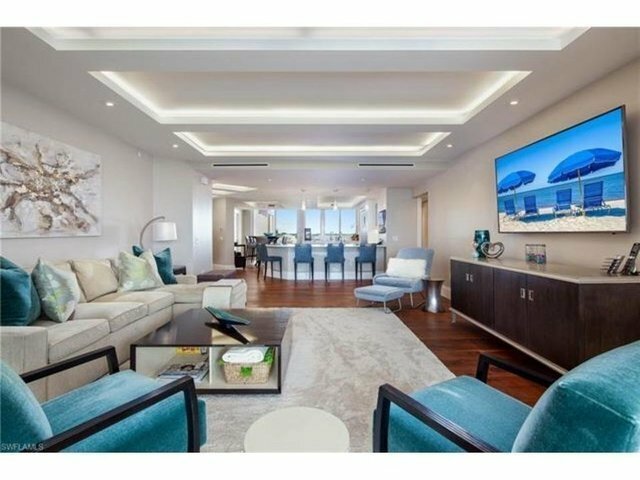 Enter a world of sleek, stylish, sophistication resulting from a total renovation of this three bedroom three bath luxury tower residence with beautiful view of the Gulf of Mexico. The dramatic custom lighting and stunning "Leathered Walnut" wood flooring provide the perfect backdrop for the modern coastal lifestyle. Enjoy a fabulous well equipped gourmet kitchen with generous work space and incredible seating capacity. The main living area is filled with natural light from dawn until dusk, but the spacious lanai is the place to be at the end of the day as you watch the sun sink into the gulf. This residence represents the pinnacle of quality, craftsmanship, luxury and style. Two deeded garage spaces in secure garage below the tower are included as well as a storage locker on the garage level. St Raphael was built with impact resistant glass on all windows and sliders throughout the building and was the first tower on the Boulevard to be built with 9' ceilings. The prime location of St Raphael (just steps from walk-up tram station #6 and boardwalk to the beach club), the amazing St Raphael amenities and incomparable Pelican Bay lifestyle complete the package.